Although it may seem that I am on a major kick for atmospheric acoustic music on my review-free time, I am actually listening to something pretty gnarly when writing is not involved. Yet when it gets to the review heap which hopelessly piled up on my desk and computer, the first one in the stack just happens to be one of those atmospheric quieter records. 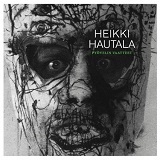 So was the case with Heikki Hautala’s Pyovelin Haatteet. No one really knows with Ektro what kind of music you are going to get. Retro, stoner, doom, this label is pretty eclectic. One thing is certain however. When it gets to supporting local Finnish acts, they are unparalleled in their devotion. The case with Heikki Hautala appears to be exactly that. Otherwise, I see little reason why this music was committed to a full-scale release. The whole album is one person playing acoustic guitar, locked in all alone somewhere in a rustic cabin tucked away in a middle of the forest. On a trip to that remote location Heikki only has the aforementioned acoustic guitar and 4-track recorder. As far as ideas go on Pyovelin Haatteet, they are pretty limited and not brimming with variety either. It appears that Heikki Hautala made it to the cabin a little dejected, certainly somewhat exhausted and possibly with a hangover. The pace is the same intermediate crawl throughout and the songs don't differ much one from each other in terms of melodic progressions. If Heikki wasn't singing, there is a good chance they would all blend together. Alas, the man is vocalizing using no ups-or-downs, matter-of-factly nasal voice. There is probably a ton of meaning in the lyrics, but given no explanation, booklet or otherwise I am unable to grasp why Pyovelin Haatteet is called Executioners Clothes and a lot of this record's depth will be lost on non-native speakers. So, outside of dedicated Finns who may be into the stoned lonely guitarist I can't recommend Pyovelin Haatteet to many others.